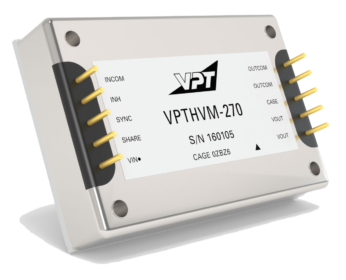 VPTHVM-270 Bus Converter | VPT, Inc.
With up to 200W of output power, this regulated bus converter module operates from a 270V bus to step down the power to create a 28V bus for your power system. A wide input voltage range accommodates MIL-STD-704 input power requirements for avionics, mobile, ground and other applications. The high efficiency design reduces input power requirements and eases thermal management. To provide you with the most accurate data for the actual performance of this product once deployed, please note that the electrical performance data provided below is at Tcase = -55° C to +100° C, Vin= +270V ±5%, full load, unless otherwise specified.